Whether the ‘A’ stands for ‘appropriate’, ‘amicable’, or ‘alternative’, all out of court dispute resolution modes, collected under the banner term ‘ADR’ , aim to assist the business world in overcoming relational differences in a truly manageable way. 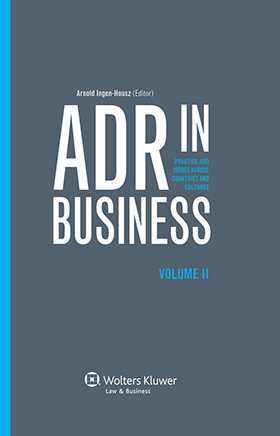 The first edition of this book (2006) contributed to a global awareness that ADR is important in its own right, and not simply as a substitute for litigation or arbitration. Now, drawing on a wealth of new sources and developments, including the flourishing of hybrid forms of ADR, the subject matter has been largely augmented and expanded on two fronts: in-depth analysis (both descriptive and comparative) of methodology, expectations and outcomes and extended geographical coverage across all continents. the role of ADR in securing investment and other specific objectives. In its compound thesis – growing in relevance every day – that numerous dispute resolution methods exist whose goals and developments are varied but fundamentally complementary, the multifaceted approach presented here is of immeasurable value to any business party, particularly at the international level. Practitioners faced with drafting a dispute resolution clause in a contract, or dealing with a dispute that has arisen, will find expert guidance here, and academics will expand their awareness of the issues raised by ADR, in particular as it relates to arbitration. A broad cross section of interested professionals will discover ample material for comparative study of how disputes are approached and resolved in numerous countries and cultures.